Oooh, egg nog. I’m ever smitten by its festive flavor and creamy decadence. I wait all year for it to come back to me in the form of frozen yogurt, steaming lattes, and even cake. I love the way it matches perfectly with my favorite spice — magical nutmeg — and how it reminds me of the occasional milkshakes I sometimes sipped in my younger days. In a large heatproof bowl, whisk together the yolks, 2 tablespoons sugar and rum until smooth. 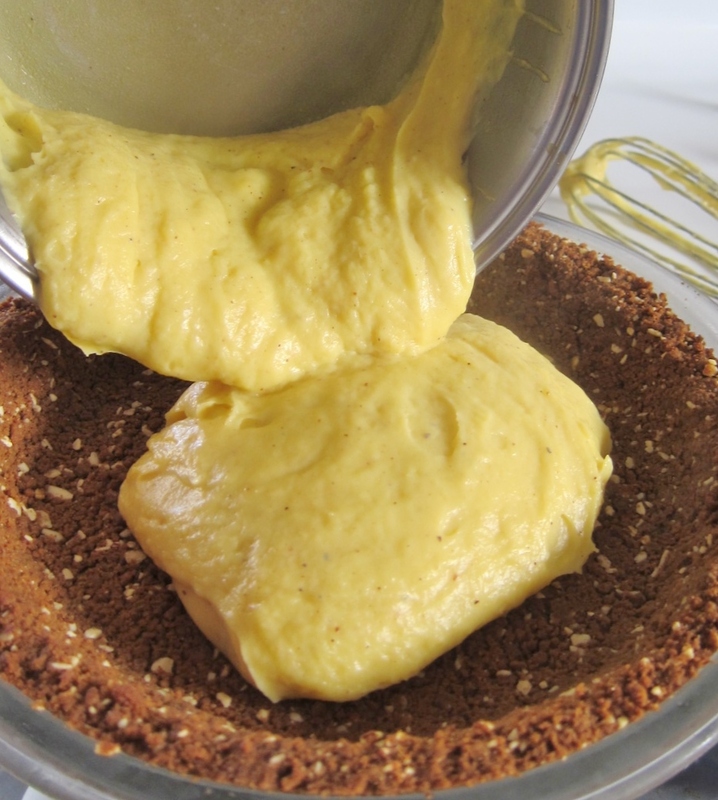 Sift the corn starch, flour, salt, and ½ teaspoon nutmeg over the yolk mixture. Mix well; set aside. In a medium saucepan, heat egg nog over low/medium heat, whisking constantly. Egg nog will come to a simmer and then froth up; at this point, turn off heat and keep whisking for a few more seconds. Let egg nog sit in pan for 30 seconds; meanwhile, give the yolk mixture another stir. Working rapidly, pour about a third of the hot egg nog into the yolk mixture, whisking vigorously. Add remaining egg nog to bowl and mix continually for 30 seconds to a minute. Place a sieve over the saucepan and quickly pour mixture back into pan through sieve. Remove sieve, turn heat to low/medium, and whisk constantly while mixture thickens, 2-3 minutes. Just when the texture is becoming pasty, pudding-like, and begins to bubble, transfer it to pie crust and spread evenly to edges. Chill. When the pie filling has cooled completely, beat whipping cream on high speed with 1 tablespoon sugar and ¼ teaspoon nutmeg, until voluminous and firm. Spread evenly over the cooled pie. 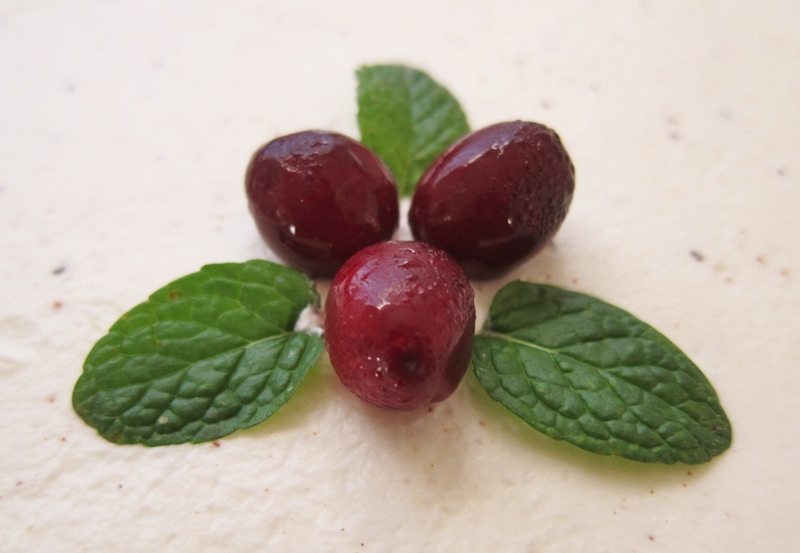 If desired, decorate with fresh cranberries and peppermint leaves. Keep refrigerated and covered, serving chilled, and eating within 24 hours. 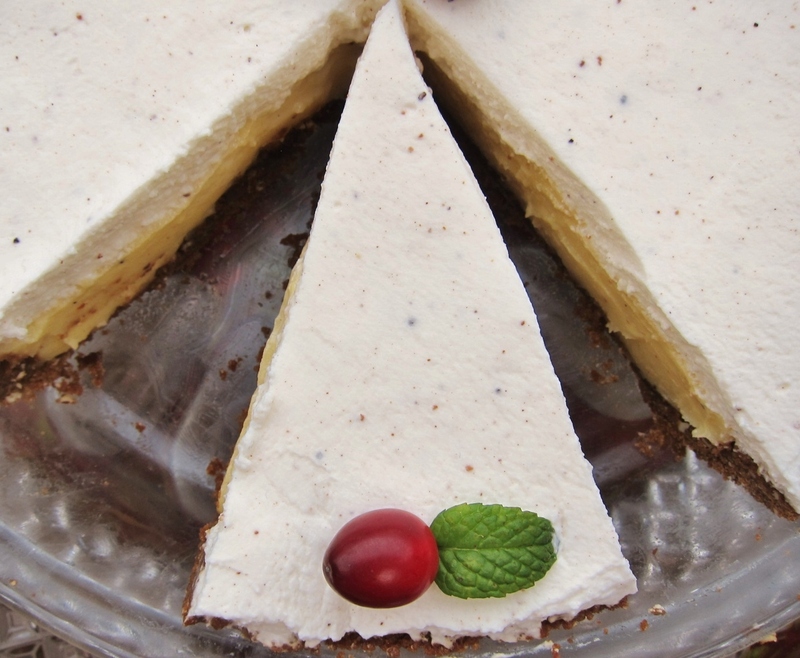 Custardy and crisp at once, egg nog cream pie is a successful celebration of the beverage behind it. 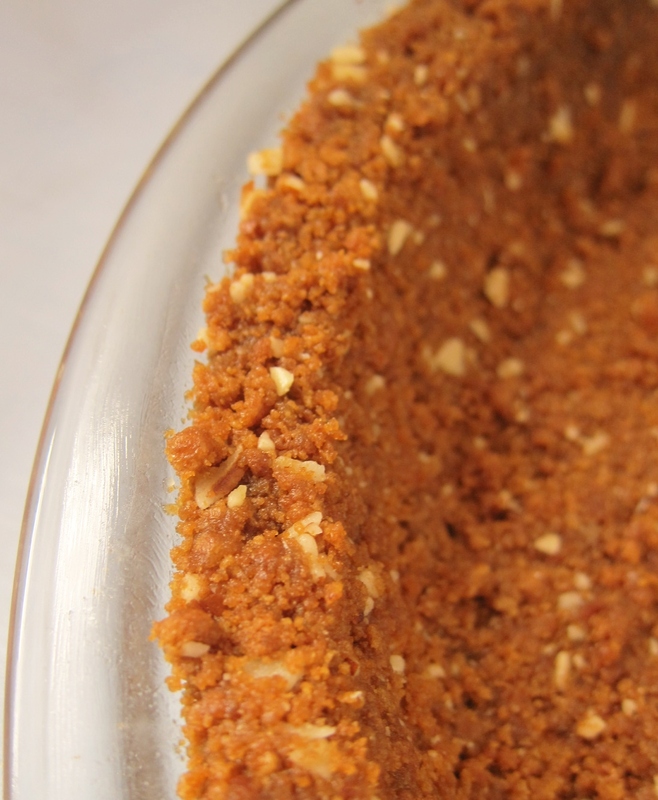 Its spicy gingersnap crust is rich with butter and bits of almonds, and is balanced by the creamy coolness of every bite. Easy to make and scrumptious to eat, this dessert has thrilled both lovers and loathers of drinking egg nog. The nutmeg throughout is a natural match, giving the dessert even more of a holiday flavor than the main ingredient already offered. And the more holiday flavor, the better — ’tis the season! *Maybe next time… Dark rum or brandy are classic stand-ins for the spiced rum, or if you prefer not to use booze at all, substitute half vanilla extract and half milk or water. For a delicious DIY version of this pie, use homemade gingersnaps and freshly ground nutmeg. While the whipped cream pairs nicely with the egg nog custard, you could make a lighter, sweeter topping by using the egg whites (from the yolks) to make meringue, like this one. Finally, in the crust, pecans, macadamias or other favorite nuts can deliciously replace the almonds, or the nuts can be skipped all together and replaced with more gingersnaps. **A note on egg nog: For my pies, I used Clover Organic egg nog, which contains a bit of organic thickening agent (i.e., tapioca starch); I suggest taking a similar route, since egg nogs without any added thickener may produce a pie that does not set, while those with many artificial thickeners could produce a rubbery pie. This entry was posted in Baking with Booze, Pies, Tarts, Tortes & Cheesecakes, Sweets and tagged baking, christmas, cream pie, creamy, custard, december, dessert, egg nog, food, gingersnap crust, gingersnaps, holiday, holidays, ice box pie, icebox pie, no-bake, nutmeg, pie, pudding, recipe, rum, spiced rum, thanksgiving. Bookmark the permalink. I love the evolution: from drink to cake to pie. 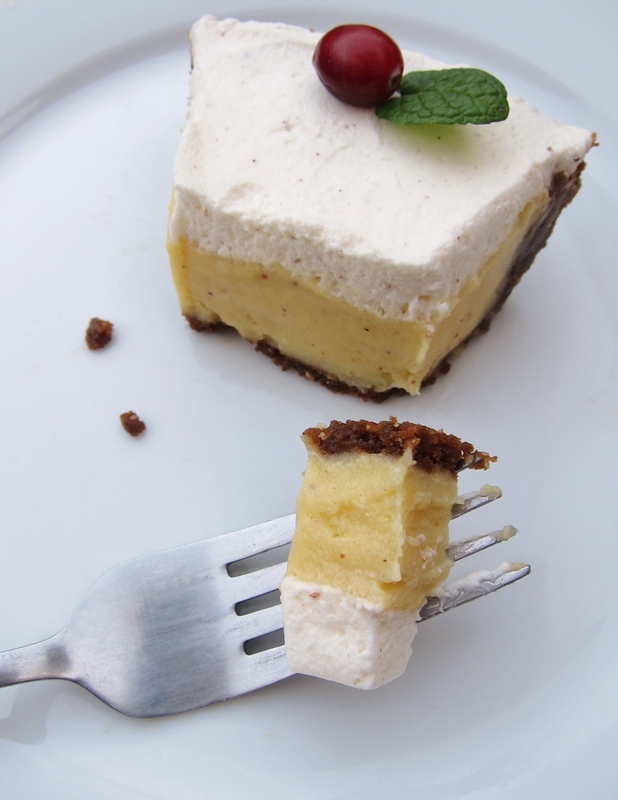 And cream pies (although I often claim to be anti-pie) are a real favorite of mine; they’re so rich and decadent. I imagine that this pie in particular would be quite a temptation, especially with the gingersnap crust (! ), although I like what you say about how it forces you to “drink” your egg nog slowly. Cream pies are my favorite, too — probably because they’re the most like ice cream. Here’s to eating egg nog in many forms, and especially to baking with beloved grandmas! How beautiful! And yes, a more sensible way to consume your eggnog, unless you are me and have one slice too many! 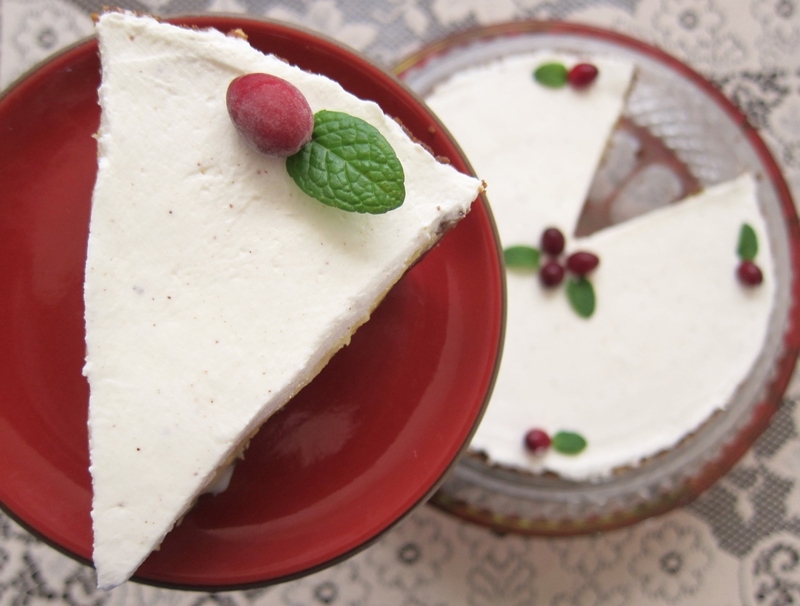 I love the idea of eggnog in dessert and this sounds mouthwatering. But my jaw dropped looking at your pictures – there is absolutely no way you could have made this look more festive and beautiful, right down to the plate you used. Gorgeous! Oh my goodness, this looks absolutely divine. I love egg nog but have never made it into anything, I might have to try this year! This creation of yours looks seriously delicious! 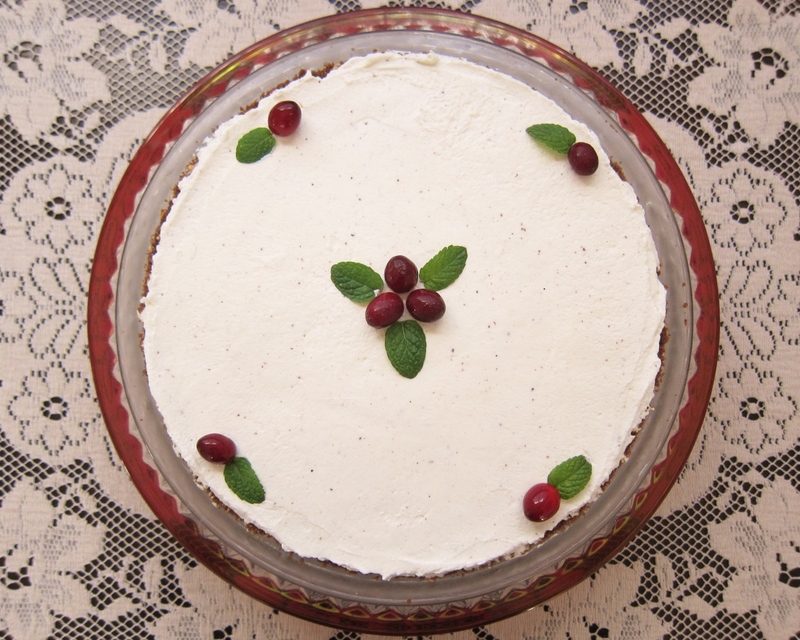 And the way you decorated it with the cranberries and peppermint leaves looks really beautiful, and also very festive. I hope you had a wonderful holiday this week! Love, E.
Thank you, dear E! I hope you and R had a lovely Thanksgiving, too. Thank you, Jen! 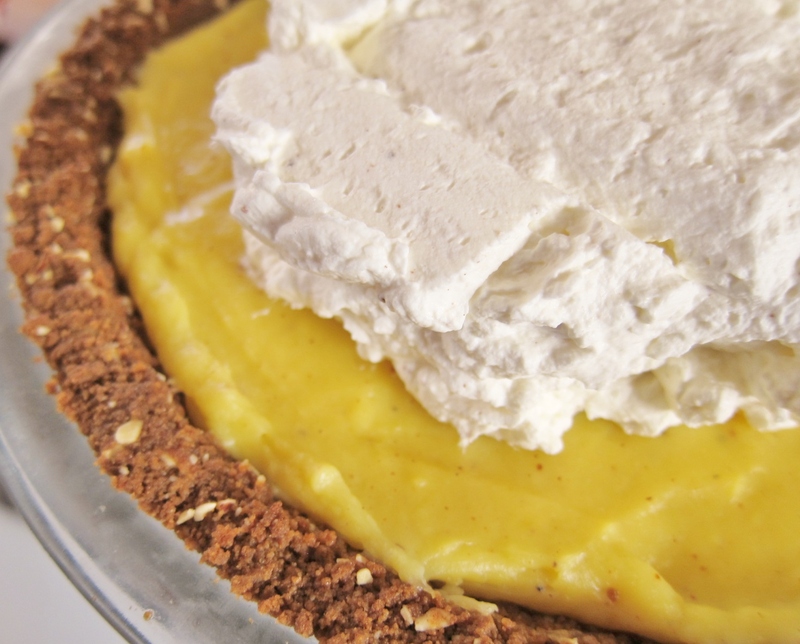 It could be argued that egg nog is meant to be eaten, not drunken – so this pie could be a great place to start! Yes, I think I need to practice this a few more times to share with you before the egg nog is gone (and then we’ll make our own!). Thank you for your enthusiasm! Oh man, this sounds SO GOOD.